I’ve been thinking about changing my trail name. Huckleberry Finch has great meaning for me, but there just might be a more appropriate moniker: Blanche DuBois. You see, on the Appalachian Trail, you always depend on the kindness of strangers. Sunday night, I cleared Mount Moosilauke, my final hurdle in the White Mountains. No more 4,000-foot peaks for 100 miles until Killington in Vermont, and this 8.5 miles felt as if I’d earned it. I felt good, even if I would be spending another night without human contact. As I arranged my things and prepared to make dinner in the shelter, a man approached out of the darkness. We chatted. “Hey,” I thought, “I know this dude!” “Did you work at the Madison Spring Hut?” I asked. He smiled and said he had. His name was Lorne, and days before they had closed the hut for the winter. I had met Lorne on Aug. 22 during my first work-for-stay at an Appalachian Mountain Club hut. (Through hikers “work” for about 30 minutes in exchange for dinner and breakfast leftovers and a night camping on the floor instead of outside.) “Met” is not the right word, though. I had asked him a single question, something like “Can I fill my water here?” “Yes,” he said. The reason I remembered him, however, is his distinctive deep voice. It’s difficult to explain, but he has a slight accent that I’d never heard and it made an impression. Though I barely spoke with him in August, he had said quite a lot. You see, the hut employees are jacks (and jills)-of-all-trades: cooks, servers and performers. They introduce themselves to the guests, sharing small details such as hometowns and where they went to college. One of Lorne’s co-workers was a Hoosier who, like me, had graduated from Indiana University. Melissa, who had completed the trail earlier in the summer, is from Mishawaka and had spent time in Indianapolis, so I spent most of my time chatting with her. 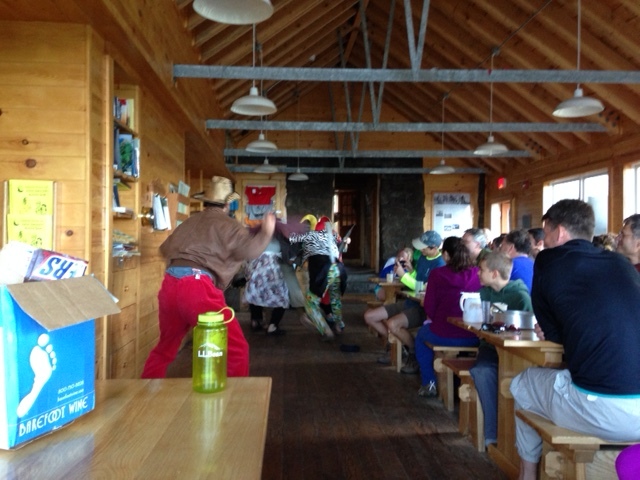 Each morning, the hut workers perform a skit during breakfast. On Aug. 23, they went with an old standby: Jurassic Park. Lorne (above left) played John Hammond, the octogenarian owner of the dinosaur preserve. Each skit has two important elements: remind guests to leave no trace on the mountain trails and remember to tip the hut workers. When I met Lorne in the shelter, we talked about the huts, the people on the trail and his winter job as one of the caretakers for Zealand Falls Hut. 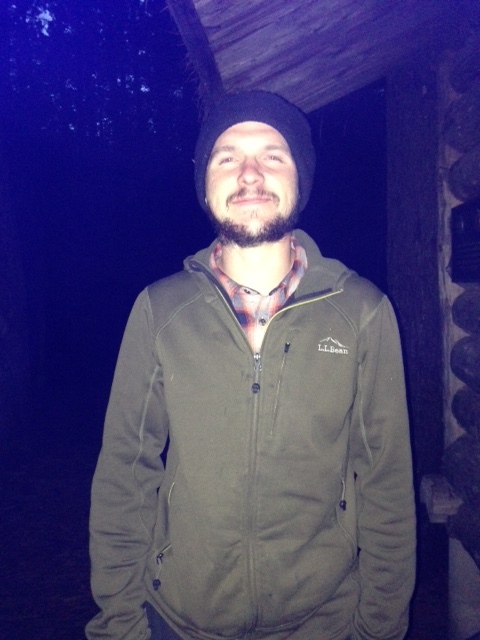 (If you are hiking the Whites this winter, stop by and see this fine man.) He mentioned a hiker named Justin with whom he’d had a great time a few weeks before. “Justin For Fun?” I asked, referencing a hiker I’d met three days earlier at a hostel in North Woodstock. “Yes!” he said with a grin. “I gave him that trail name!” Lorne gave me something, too. He shared an amazing tomato — you have to be out in the woods for several days to appreciate how good fresh produce can taste — and half his block of cheese. He also made a lonely guy feel connected to the world when he really needed it. Monday was an even better day. With the big mountains behind me, I hiked 15.7 miles. That total fell just short of my best on the trail back in August, but that is not what made Monday so memorable. A chance meeting with a stranger made my day. I was in a zone, moving pretty quickly on the flat terrain and almost didn’t see the man until I was nearly past him. “Sorry,” I said with a start. “I didn’t see you.” He was Travis Brunt, a small-business owner from Plymouth, N.H., who was out for a practice hike. He is considering hiking the Appalachian Trail next year and wanted to talk. I shared my story of the trail: the divorce, the daily postcards to my kids and how I’m hiking in memory of my father, who had Alzheimer’s. “Do you take cash donations?” he asked. “No, sorry,” I said. “Do you need anything? My truck is a half-mile back (he pointed the direction opposite to where he was hiking); I could drive you to town for supplies.” No, I said. I’ve got everything I need, but thank you so much. We talked for at least 30 minutes. I told him good resources to study up on the trail, books and blogs and gear tips. Before we said goodbye, we exchanged information. He promised to read my blog. He was excited and could not wait to try the trail. When I left, I had a bounce in my step. Meeting great people propels you on your hike, like extra endorphins. One thing bothered me, though: Why hadn’t I taken that cash donation? I was trying to show him I wasn’t a con man by turning him down, but I could’ve mailed in his money when I arrived in Hanover, N.H., in a few days. I felt like a knucklehead who had missed a chance to help my cause, the Alzheimer’s Association. Travis was too good to be true. He was never going to read my blog and donate when he got back to town. Life is entirely too busy. The next day, I found a cell signal on a mountaintop. I texted family and friends to let them know I was well. I checked my email. There in my inbox was an email that said I had hit the halfway point of my Alzheimer’s fundraiser. Halfway to my goal? How could that be? I would need a $200 donation to achieve that. For hours, I thought of whom that generous donor could be. That night, when I found some Wi-Fi, I was able to discover which of my relatives or close friends had made my day with their incredible generosity … Travis Brunt. A stranger I had met on the trail. Too good — and true. I’d heard about the Ice Cream Man months ago, but that was before I had to leave the trail and fell more than a month behind most other southbounders (SOBOs). Ice cream? Ain’t nobody got time for that when you are trying to get to Georgia just as fast as you can. When I passed the sign, I glanced at the house at the end of the trail but did not stop when I saw no lights on. It was getting dark, and I needed to make another mile to Trapper John Shelter, where I might see Avi and Babbul, two guys in their 20s from Israel I had met earlier in the day. On problem, though: I could not find the trail on the other side of the road, so I headed back to the Ice Cream Man’s house. Back at the empty house, I found instructions by the door inviting hikers to free ice cream on the back porch. The sign said hikers were free to sleep on the front or back porch or pitch a tent in the yard. For 50 cents, you could buy a cold Coca-Cola. (A Coke is worth more than gold on the trail!) I signed the hiker log — where I saw entries from Avi and Babbul and XL, a SOBO I had met in North Manchester — and walked toward the ice cream. All I found in the freezer was an empty ice cream box, so I returned to the front porch to set up my sleeping bag for the night. They invited me inside and introduced themselves: Bill Ackerly, the Ice Cream Man, and Moxie, a 2014 SOBO through hiker. 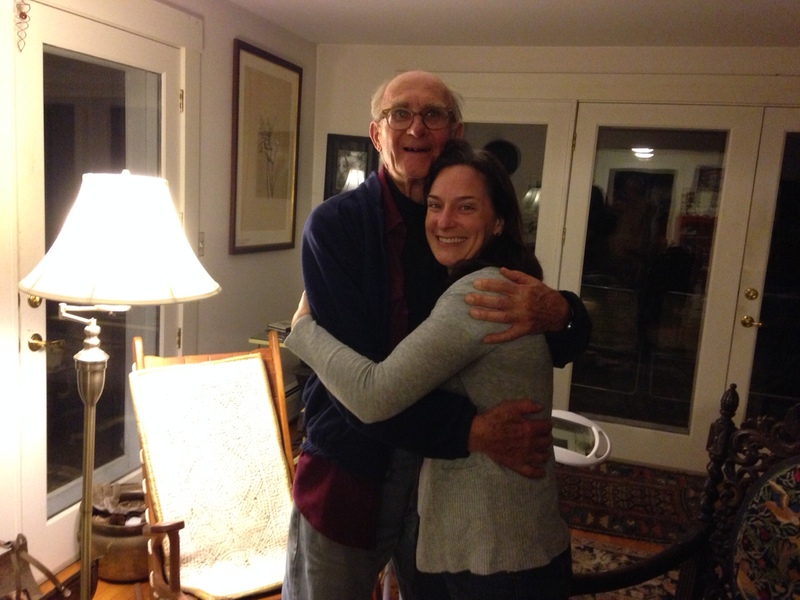 Moxie had met Bill the year before on her hike and drove down from Maine on her weekend to visit this dear friend. They had just come from dinner, and Bill invited me to stay by his fire and join them as they listened to a radio special on presidential candidate Bernie Sanders. Before the show started, I told Moxie that Bill was out of ice cream and I had left the empty box in the freezer. She thanked me, Bill got me my ice cream and refilled the freezer, then he started a fire, turned on the radio and brought us each a piece of apple pie. After we listened for 40 minutes in Bill’s warm home, he thanked us for indulging him. He — who opens his home to strangers and waits patiently on them, no matter how smelly — thanked us?!?! As we sat by the fire, I told them my story of the trail and about my blog and talked of how inspiring my encounters with trail angels like Bill and other hikers had been. Bill loved my name and brought me a copy of “To Kill a Mockingbird,” which he had nearby. Moxie talked of her hike a year ago, describing how she had been equally inspired by the people of the trail. Moxie is from Virginia and returned to Maine’s 100-Mile Wilderness this summer to work as a ridge runner, a ranger who is there to help if hikers are in danger, maintains the trail and cleans up after those selfish souls who can’t be bothered with packing out their own trash. I asked Moxie if she had heard of the amazing trail magic in the southern part of the Wilderness. “Oh, you mean Scout –” she started. “And Birdman!” I interrupted. “Wait a second,” she said. “You’ve got a blog and you wrote about them, right?” She told me that she had read my blog and that I had talked about my father in it. I had heard from a hiker — Many Faces, an Oberlin College student from South Korea — on a blog comment this summer that Scout and Birdman had printed out the blog entry and were sharing it with hikers that stopped by. And now I was meeting someone who had read the blog; this had somehow made it feel more real. Scout and Birdman’s generosity had kept me going through the rough days of August, and I will remember them always. It felt so good to know that they had appreciated my small gesture, too. That night, I slept on Bill’s porch. In the morning, as I prepared to leave, he brought me a glass of orange juice. “Anything else I can get you?” he asked. I asked if he could spare a coffee, and he came back out to warm it for me a little while later. Before I left, I asked if Bill knew how many people had stopped by for his generosity. Moxie showed me Bill’s system in the log book, revealing that I was his 1,937th visitor this year. 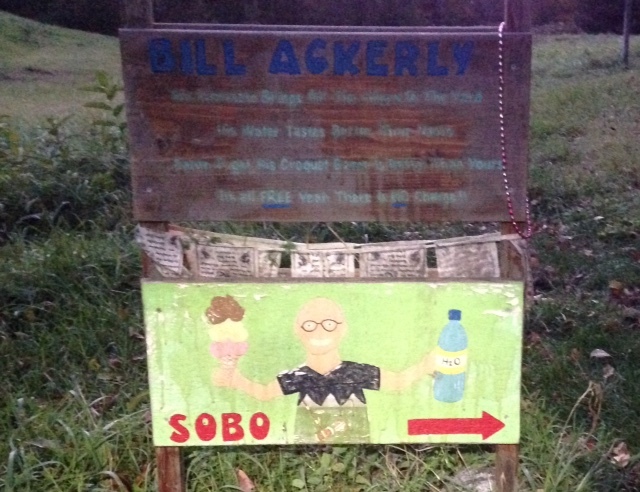 Bill has been taking care of hikers for more than 10 years, so he has spent more on ice cream than some Dairy Queens. He invited me to come back, and I told him I would love to bring my kids sometime. “You can play croquet in the back,” Moxie said, pointing to Bill’s course in the backyard. It stood right next to the port-o-let Bill installed to accommodate his thousands of hiking friends. You know, the more I think about it, I believe I will keep my trail name. Huckleberry Finch honors my father’s memory and keeps him in my heart. But the inspiring kindness of strangers on and along the trail has also earned a special place in my heart, and it will stay with me always. Everyone needs to experience this trail for at least a few days. Because experiencing the best in people is more breathtaking than anything you will find in nature on the Appalachian Trail or anywhere else for that matter. You’re not a Blanche; as you are not traumatized and separated from reality. You are out in the world to learn more about others and yourself. To grow your character and be the giver of Trail Magic to others in life.